This post has been sponsored by The Coca-Cola Company. All thoughts and opinions are our own. 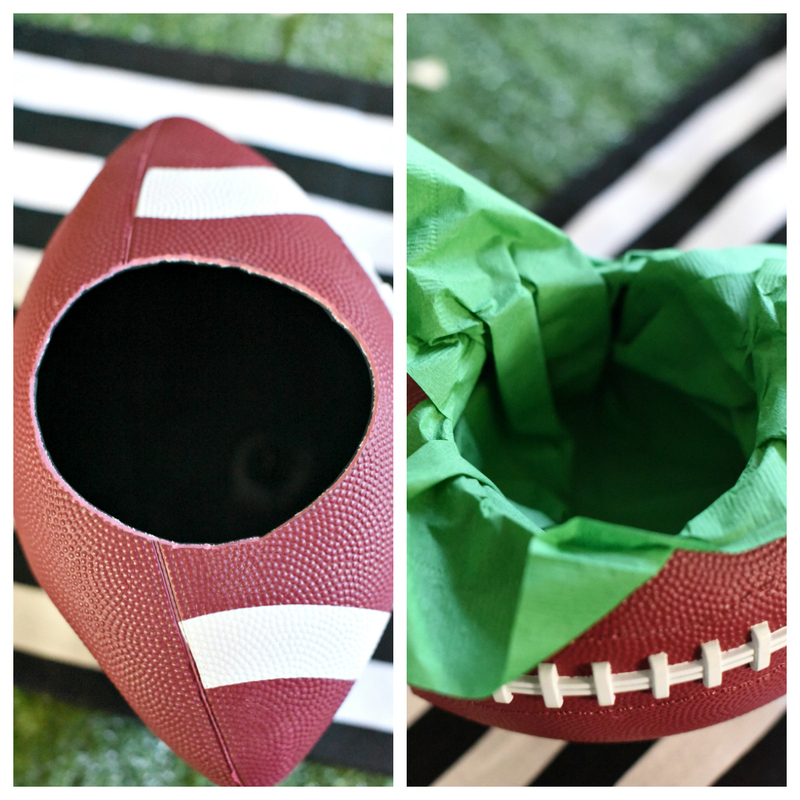 A Peek at the Fun: Are you thinking of throwing a fun football-themed party? 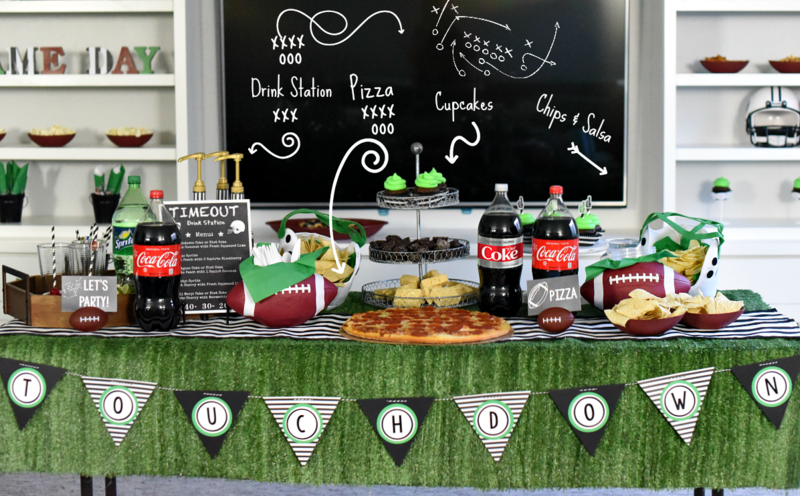 We have lots of awesome ideas for your next football party. 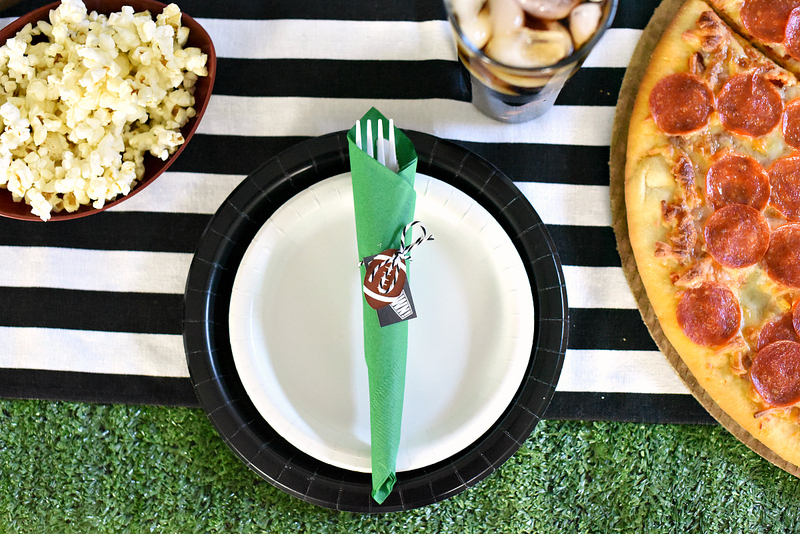 From easy tailgating ideas to football decorations and football party food, we have you covered! Something you maybe should know about Amber and Danetta–although we are good friends, we are definitely not best friends. Amber’s best friend is football (maybe second to chocolate) and Danetta’s best friend is Diet Coke®. We have accepted that we don’t rank number one and decided to embrace our “real” best friends with this football-themed party! Coca-Cola® and football, is there any better combination? We think not!! 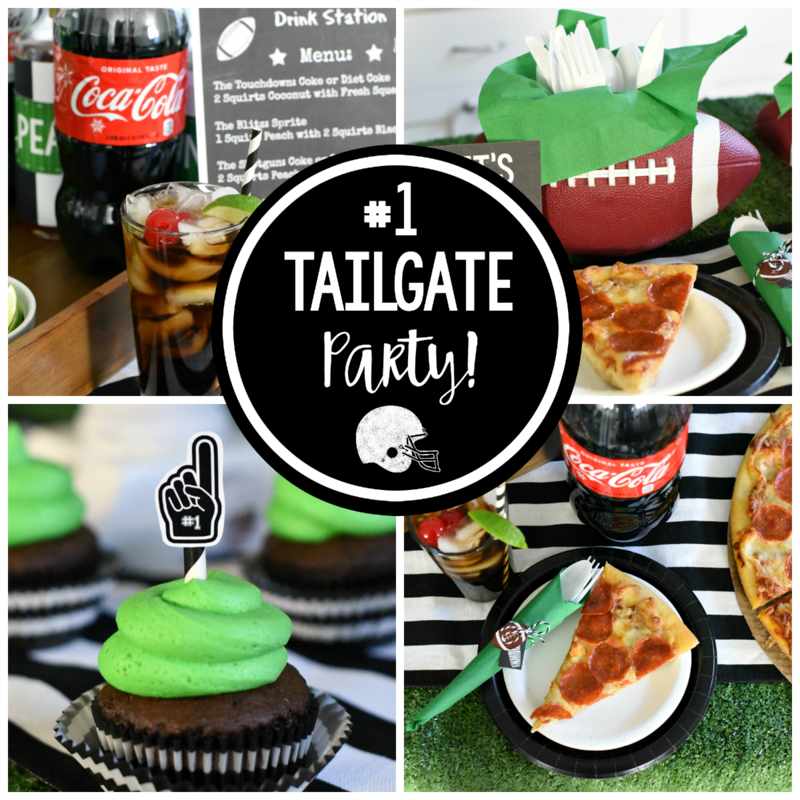 We have so many fun ideas for your next tailgating party, you’ll wish football season lasted all year! 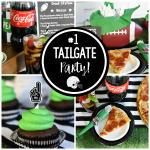 If you love a good football-themed party, too–whether it’s for the food or for the football or even just for the party–pull up a chair because we have some great tailgate party ideas for you today! Every great football party starts with great food!! Deciding what to serve is the most important decision because we all love to eat. 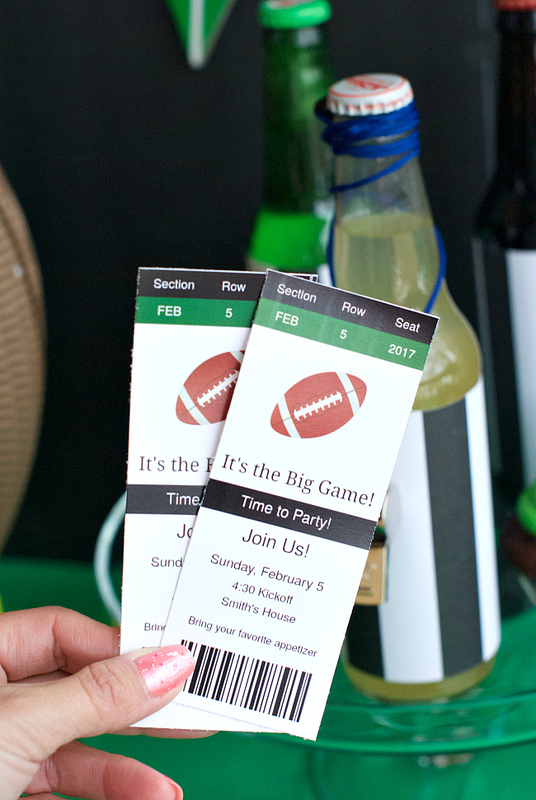 Serving fun food and drinks will keep your guests happily cheering on their favorite team. 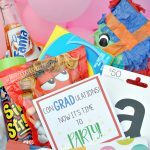 Because time and money are always a consideration, we started our party planning at Sam’s Club–game time’s favorite teammate–because we know we can get everything we need in one place. We stocked up on Coca-Cola®, Sprite®, and Diet Coke® which Sam’s Club sells by the two-liter bottles in a 4-pack on the beverage aisle. We knew we would need plenty of drinks for our fun “Time Out Drink Station” we created for this party. Have you ever had a soda pop mixed drink? They are super yummy, and such a fun idea for a party. Your guests are going to love this! 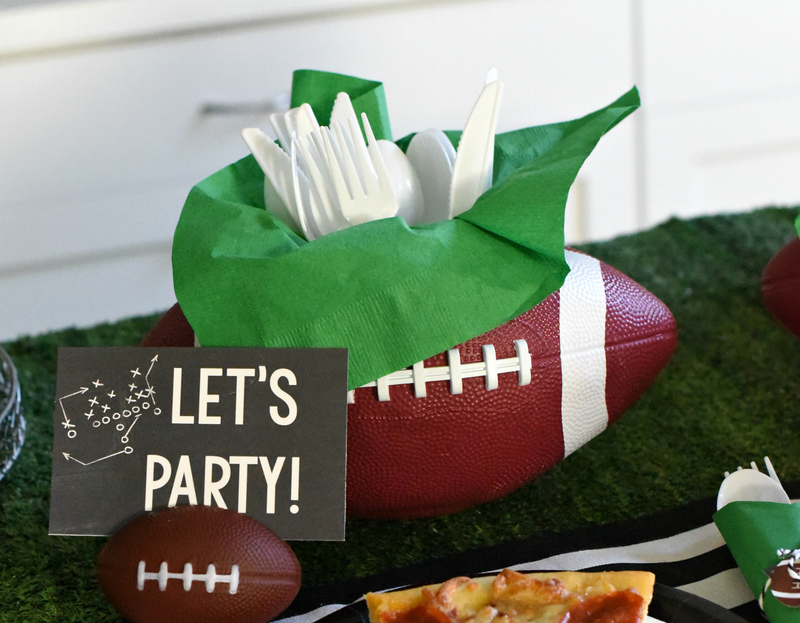 Here’s how to create one with a football-themed party twist! 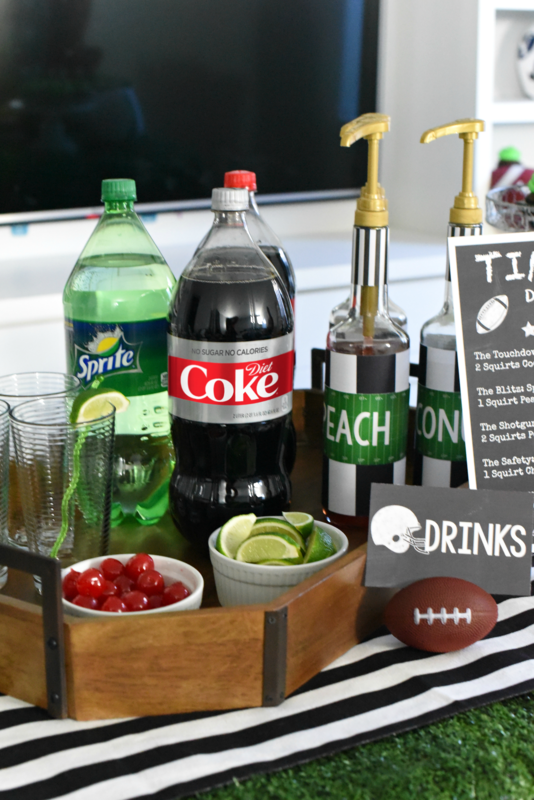 Now that you have all of your supplies, let’s put this tailgate party drink station together. With the several flavors of pop and several drink flavorings, you can let your guests mix and match to create their own drink, or they can order off the menu we have created for you. A drink station is a fun way to serve your guests and it becomes a social gathering spot. The “Touchdown” happens to be Danetta’s very favorite drink in the whole world, so maybe start with that one and work your way through the menu! 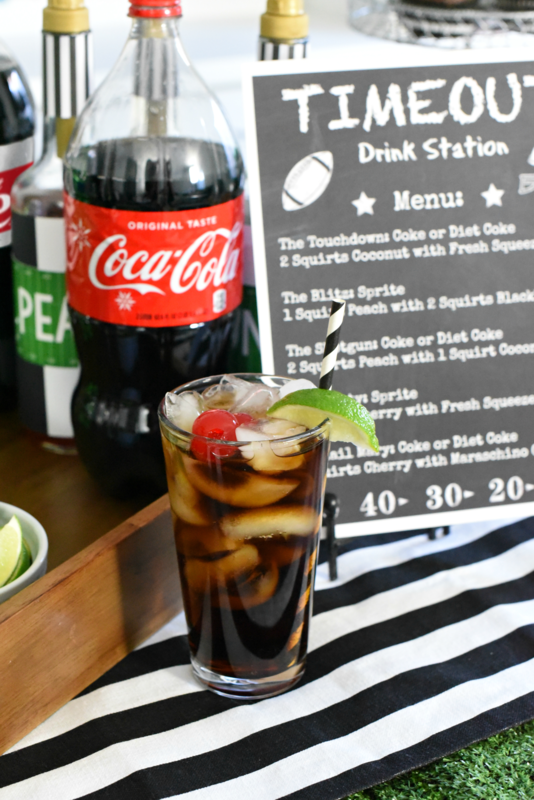 We created 5 different drinks made from Sprite®, Coke®, Diet Coke®, and various flavorings that your guests will love! And they’ve all got fun football-themed party names. 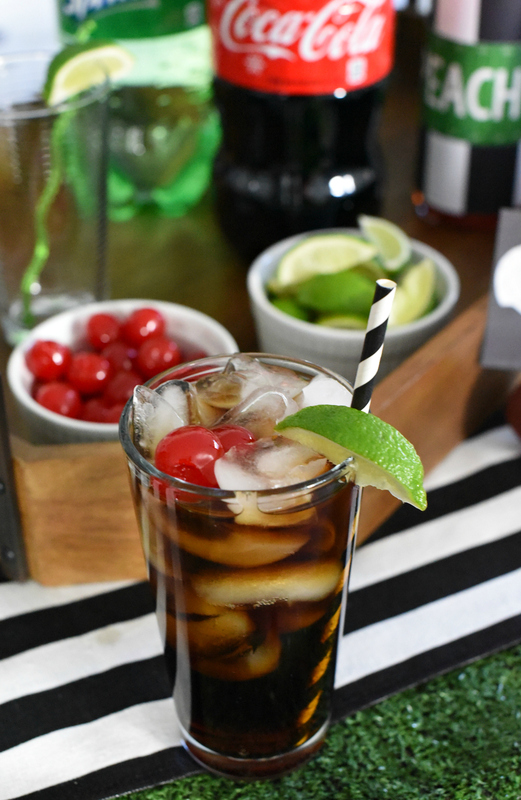 You’ll want to have your flavorings ready as well as limes and cherries that guests can toss in their drinks. 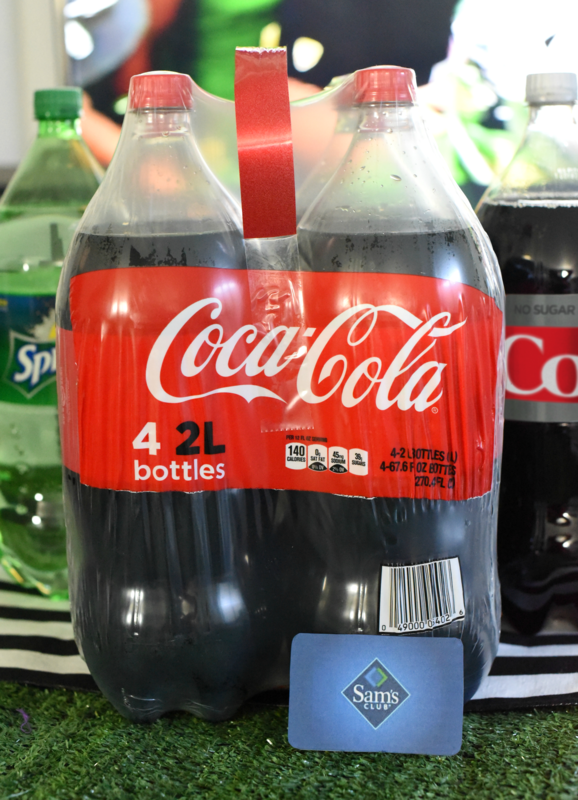 Grab these four packs of 2 liter Coca-Cola® beverages from Sam’s Club! They are the best when planning a party. Rule number one of party planning is to never run out of Coke! We also grabbed several Member’s Mark 16″ Take & Bake pizza’s from Sam’s Club because they are so quick, easy, and delicious. Because you bake them yourself, you have more control over when dinner is served. 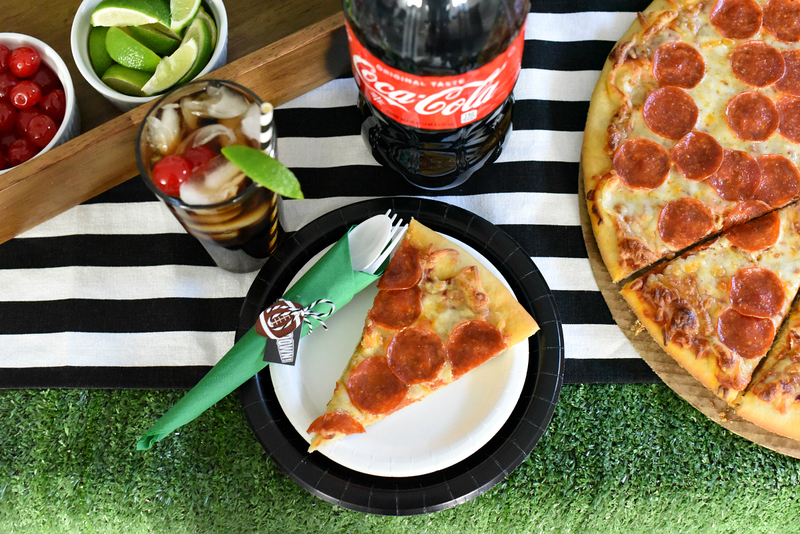 Pizza and Coca-Cola® are two of our favorite food groups! 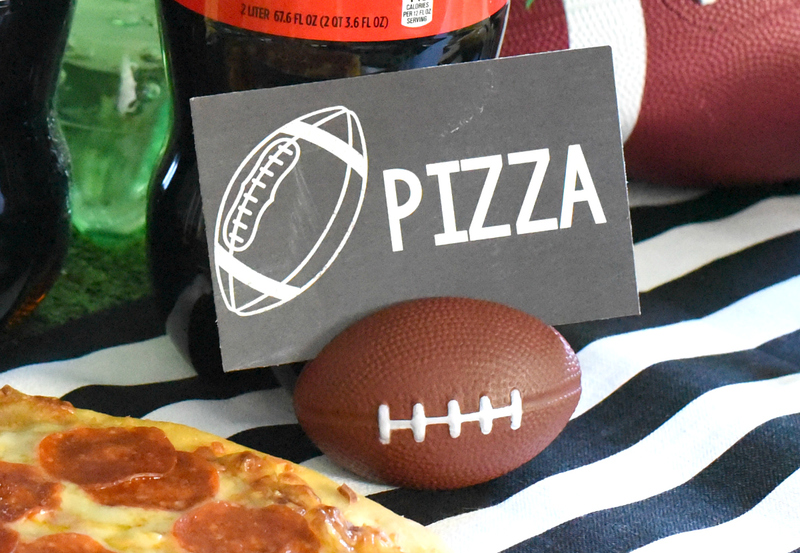 Your football party will be a hit with this perfect combo. 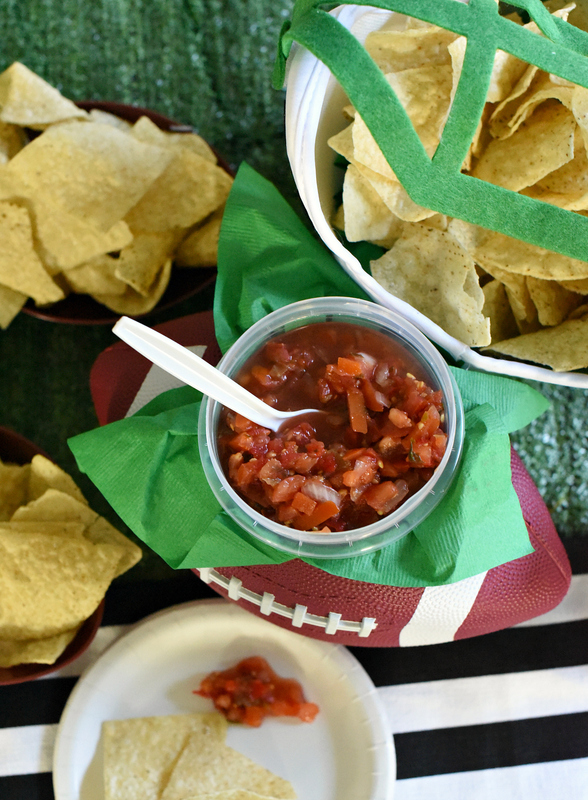 Beyond your pizza and drinks, a good football-themed party is going to need some chips and dips. 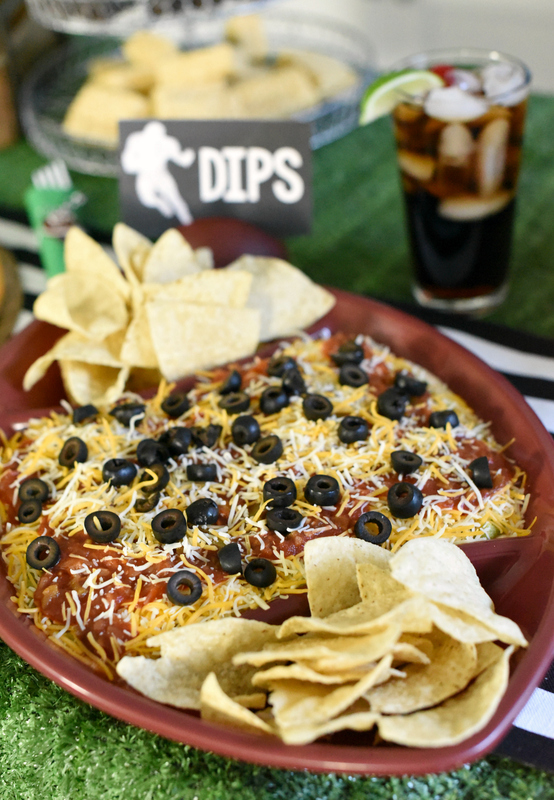 We had some fun with our serving style on these–like this 7 layer dip served in a football tray! We also served popcorn, mixed nuts, pretzels, salsa, chips, candy, and these cupcakes. 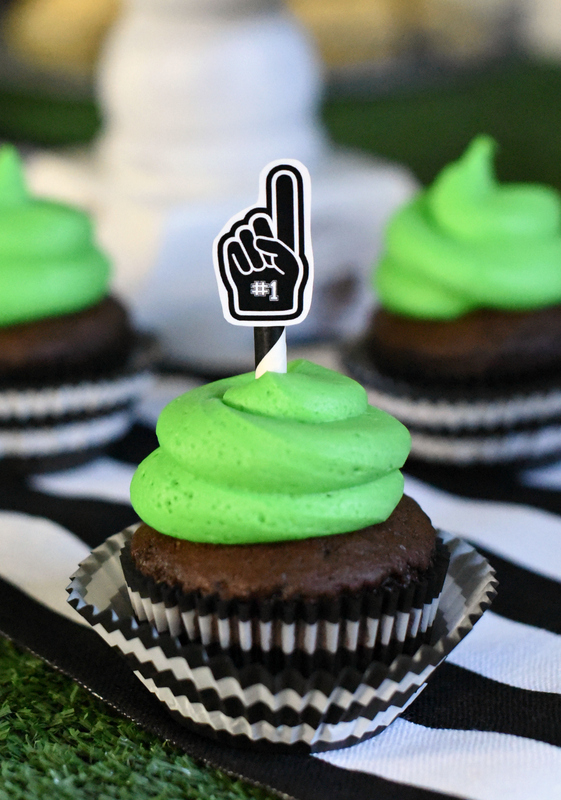 The cupcakes are as easy as making cupcakes with green frosting and adding these fun cupcake toppers. Oftentimes, the men come to a football party for the game and the food, but we don’t want to forget you ladies who are coming for the cuteness factor, too. This black, white, and green decoration motif was perfect for this party. Let’s start to break things down for you. We started with a piece of green turf which we repurposed to use as a tablecloth, added a black-and-white table runner, and had a fun football-themed table. From there, we added little elements to make our party look original and festive. 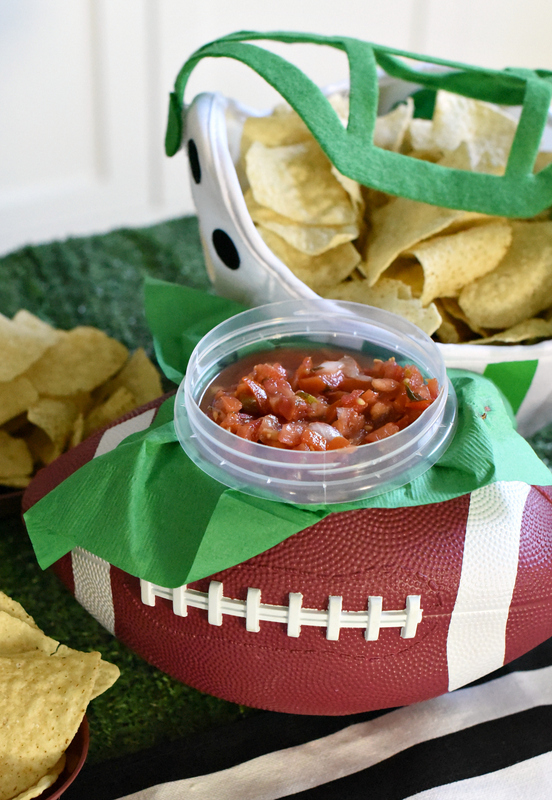 One of our favorite elements were these footballs we used as a salsa holder and utensil caddy. Aren’t these so fun? Let’s make them. Start with a football that has been inflated for at least a couple of days. This will help the football retain its shape once it’s been cut. Trace a circle with a sharpie. We used the bowl we wanted to insert in the hole as our guide. Cut with the knife along the traced line. The football is tough to cut through so we would recommend using a new blade that will allow for easier cutting. Please be so careful while cutting so you don’t slip. Just go slow, and it will cut! Once you have your football cut, you can use it for anything you want. 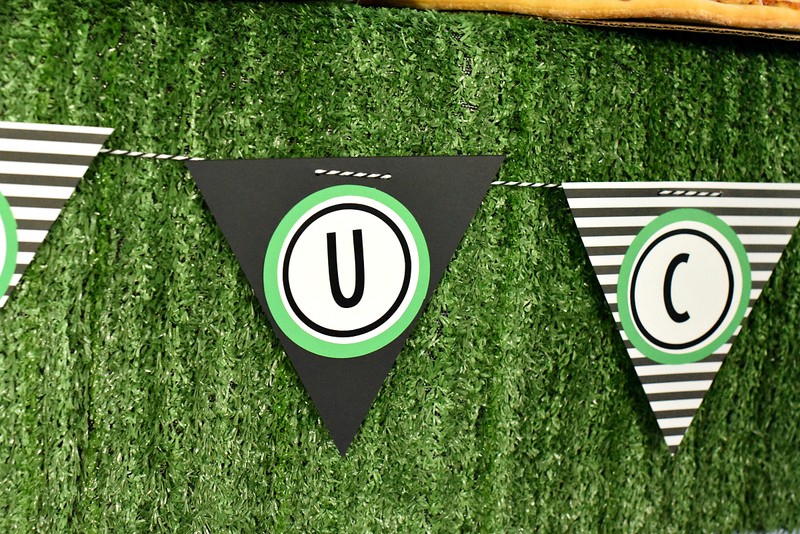 No party is complete without a fun banner or in this case fun bunting. We love the little touch of color that bunting adds to any celebration. We have made your life easy when it comes to bunting because we have the letters already done for you. Get your letters here: Bunting Letters. Then just get some fun paper in green, black, and black-and-white stripes. Make yourself a triangle template and cut out enough triangles for what you want to spell (we did “touchdown”). Print and cut the letters and glue them on. Then string it up and hang it somewhere festive for your party! One last fun touch for our party, we printed little signs for each of the various food options and stuck them into little footballs to display all over the table. 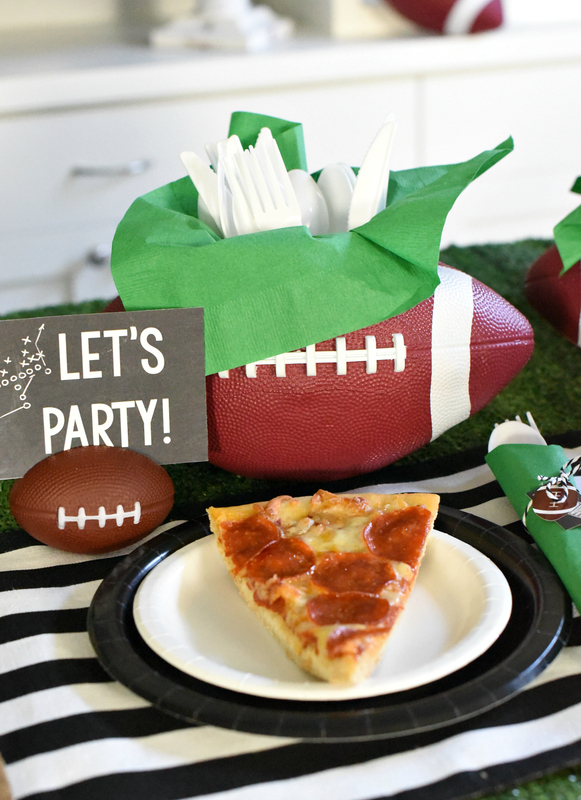 So, are you ready to throw your own football themed party this year? We hope these fun ideas have helped you! 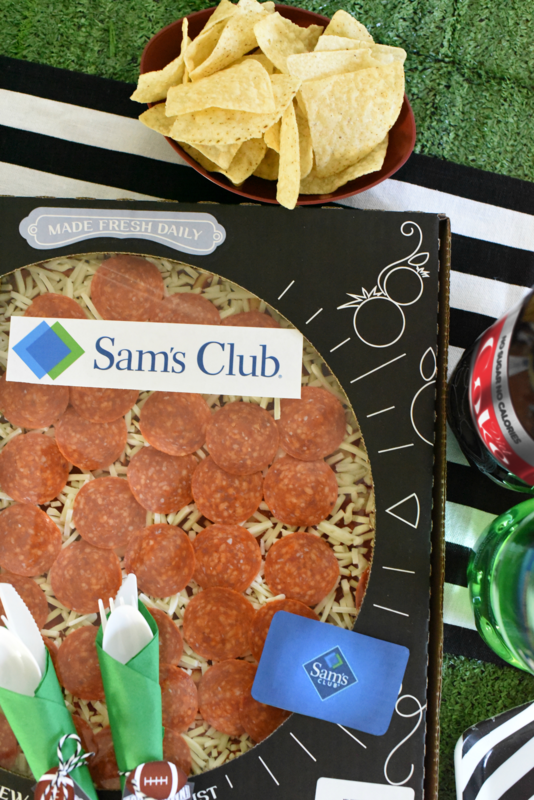 Remember to grab your pizza, Coca-Cola®, and everything else you need at Sam’s Club. It really is game time’s favorite teammate. It just makes the shopping so easy! And have FUN throwing your football party!